Awe! How adorable! You must be spending all your free time with them. I think you’ve got this grandma business down pat. 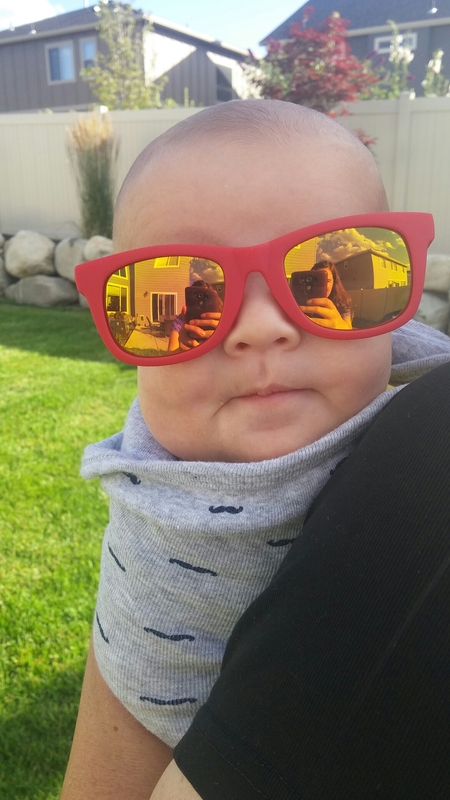 Such an adorable baby…super cool in those shades too! It’s amazing how fast they grow! Enjoy those little darlings. The pictures are very clever. It was so much fun! I had to get a picture of him! What a sweetheart. You must be in heaven. They are so adorable and have grown so much! In a world of turmoil, these kids are so good at restoring healthy emotional feelings to our lives. haha so true he looks like a movie star! Yes Jonathan this does restore our emotional state! He’s so cute. My son took a picture of our grandson with Groucho Marx glasses & moustache. It was hilarious. That little half smile tells me he knows he’s sporting! Cuteness overload!! Wow a 2 thousand words post !!! LOL! He’s so cute! He was so serious in that last image. Too too cute! Oh my heart, I’m aching for a cuddle. Enjoy every second! How cute is a baby in sunglasses? Really! Look at that perfect skin and sweet face! That is too cute! They are growing so fast! What a cutie those sunglasses are the bizz!